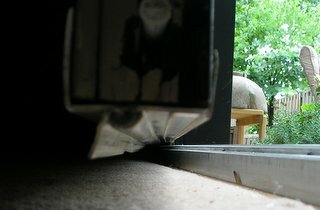 Door sweeps often need replacing. 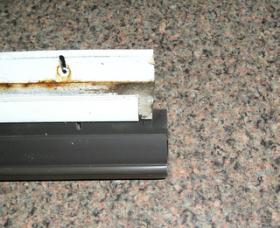 This old doorsweep on the bottom of a steel entry door is just plain worn out. It has lost its vinyl fins and is not sealing properly. Because of this, the rain and cold is getting in as well as dirt that makes the floors dirty on the inside. Time to pull it off and replace it with a new one. The sweep on this door was only a few years old, so it was not difficult to find an exact replacement. 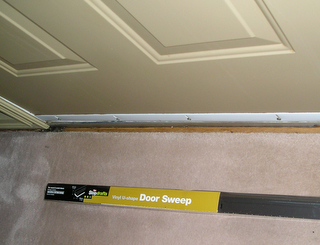 Some door manufacturers make sweeps that only fit their doors, which forces you to buy the sweeps from them. I've found that the height of the fins and the gap underneath the door varies form one manufacturer to the next. You need to match the gap to the new sweep that you are buying. If you try to put a sweep on with fins that are too tall, the seal will be so tight you wont be able to close the door. It's sometimes possible though to adapt an easily available sweep kit. For this entrance, I thought a dark brown draft blocker would look better on the door than the old white one. The type of sweep I bought wraps around the bottom of the door and has fins about 1/4" tall. It fit underneath the door and still left room for adjustment up and down. Take out all the screws holding the old weatherstrip on. Usually the screws are on the inside to keep them away from the weather. 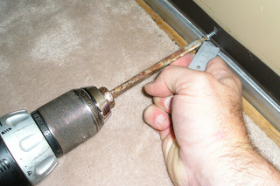 Dont bother keeping the old screws, they are often rusted and sometimes difficult to remove. Be careful not to damage the old sweep. You need it in one piece so you can measure it to cut the new one properly. Dont throw it out yet ! Use the old sweep as a template for cutting the new one. Here the old sweep is laid on top of the new and its easy to see the new one needs to be cut about 3/8" shorter to match the length of the old. Notice that the old sweep has notches cut in the ends to clear the door stops on both sides of the door. You need to remember to cut these notches in the new sweep after you have cut it to length. 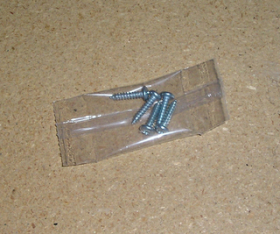 The new sweep comes with screws. These are usually made by the lowest bidder from a special grade of steel that is cheap to manufacture and has the strength and consistency of hard cheese. They also rust seriously fast. Keep them only long enough to get an identical packet of 18-8 stainless steel self tapping screws from your local hardware store. A nice door requires nice screws. It might cost a dollar more for stainless steel fasteners but its much better having screws that wont self destruct as you screw them in or rust out a few months after you install them. When you cut the new doorsweep to length use an old piece of lumber to help the sweep hold its shape. If you dont do this and you try to saw the sweep to length the plastic will vibrate and can crack when it gets stuck in the saw blade. 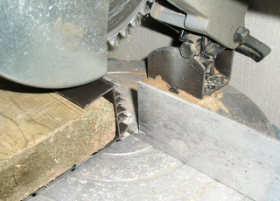 The piece of lumber also makes it much easier to hold the sweep in the saw and enables you to make a nice clean cut. I'm using a power miter saw but there is no reason you cant use a hacksaw and manual miter box. To get a nice cut with a manual miter box , use the lumber as shown and clamp everything down so you can use two hands to carefully guide the hacksaw. Slide the draft blocker on the bottom of the door and position it . 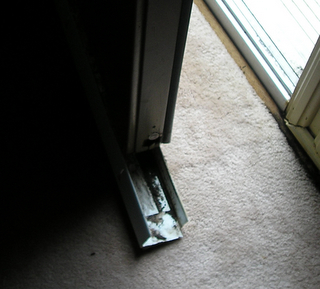 Try the door several times to make sure it opens easily yet with a good bottom seal. I'm using self tapping screws with a Robertson head. 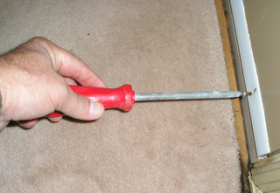 See how they stay on the end of the screwdriver bit without falling off. That allows me to use my free hand to pull up on the weatherstrip to make sure its not too tight . The self tapping screws also drill their own pilot holes. That way I dont need to predrill pilot holes in this steel door. Wow, That new sweep looks much nicer than the old white one did ! 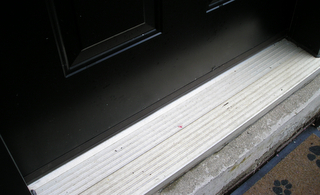 If you are getting a new door installed ask the installer if he will include a couple of replacement weatherstrips in the contract. If you use the door a lot, it wont be long before you have to change them.